I have a great fondness for tomatoes in all their guises, whether they be sundried or sunblushed, puréed or passata’d, or just as nature intended. For me, they are a perfect foil for a salty slab of Cheddar in a doorstep sandwich, the savoury mixer in my favourite cocktail, and a rich and warming base for casseroles, pasta and curry sauces. I buy the cheapest tinned tomatoes – they tend to be more watery than the more expensive brands but if you cook them down for a bit longer, I really don’t think it makes much of a difference – and they’ll still be of a better quality than any fresh you could buy at the same price anyway. Fresh tomatoes, however, are something that I don’t mind paying extra for and I make sure I treat them well. There’s no point in paying a premium for decent tomatoes and then putting them straight in the fridge, which kills the enzymes in them and annihilates the flavour. I always keep my tomatoes in the fruit bowl where they belong. I usually buy tomatoes that are still on the vine and have recently started buying organic ones. They are beautifully red and when I open the packet, I’m engulfed by a smell that takes me back to my grandfather’s greenhouse where he used to grow his own. No cheap tomato will ever do that for you. No matter how hard you sniff. I’m a sucker for anything miniature – kittens, Cadbury’s mini eggs (haven’t had them for years – don’t even know if they’re gluten-free or not), those toy cooking sets you can buy in Ikea, my son’s first shoes, skirts (back in the day!) – and fruit and vegetables are no exception. You can buy all manner of baby tomatoes these days. They’re delicious for snacking and they do obviate the need for a napkin to mop up the rogue juice and pips that you inevitably find splattered on your chin and down your front when you sink your teeth into a full-sized one. They’re also beautiful when roasted. Coating them with balsamic vinegar in this recipe intensifies their flavour even more and gives them a rich and meaty texture. PS – sorry the photos aren’t up to snuff – I had to use my smartphone! Preheat the oven to 150C (my oven is fan-assisted, so adjust accordingly). Cut the baby plum tomatoes in half and toss them in a bowl with the unpeeled garlic cloves, balsamic vinegar and a good glug of olive oil. Arrange the tomatoes cut side up in a single layer on a non-sticking baking sheet and tuck the unpeeled garlic cloves in amongst them. Sprinkle with sea salt and a good grinding of black pepper. Roast in the oven for 45 minutes. To make the spaghetti, first of all, cut a strip of greaseproof baking paper about 30cm long and wide enough to fit underneath the rolling machine. You will need this when cutting the pasta with the spaghetti attachment. Put the flour, cornflour, xanthan gum, dried herbs, garlic granules and salt into the bowl of the food processor. Blitz for a couple of seconds to mix the flours and break up any lumps. Add the three eggs and the oil. Blitz again to combine and gradually add a little cold water through the funnel until you have a soft dough. Tip the dough out onto an unfloured work surface and knead into a ball. It should be soft and ever so slightly tacky to the touch*. Now either wrap the ball in clingfilm or return it to the bowl of the food processor and put the lid back on to keep the pasta from drying out. Place a large plate dusted with flour next to the rolling machine. Working with a tomato-sized piece at a time, roll the dough out on an unfloured surface with a rolling pin until it is a few millimetres thick. Try to get either the width or the length approximately the same width as the pasta rolling machine. Pass the dough through just once through thickness settings 2 to 4**. Make sure you carefully support its weight with your free hand. Dust each side of the sheet of dough liberally with flour*** and make sure that the greaseproof paper is in place underneath before putting it through the spaghetti attachment. Slide the greaseproof paper out from under the machine and tip the spaghetti onto a plate. Repeat until all the dough is used up. Cover with clingfilm until ready to use. At the end of the tomatoes’ roasting time, remove them from the oven and keep warm. Bring a large pan of salted water up to a rolling boil and cook the spaghetti in two or three batches. As soon as the pasta is in the pan, put the lid on and remove the pasta as soon as the water has returned to the boil. Drain and add to the tomatoes. 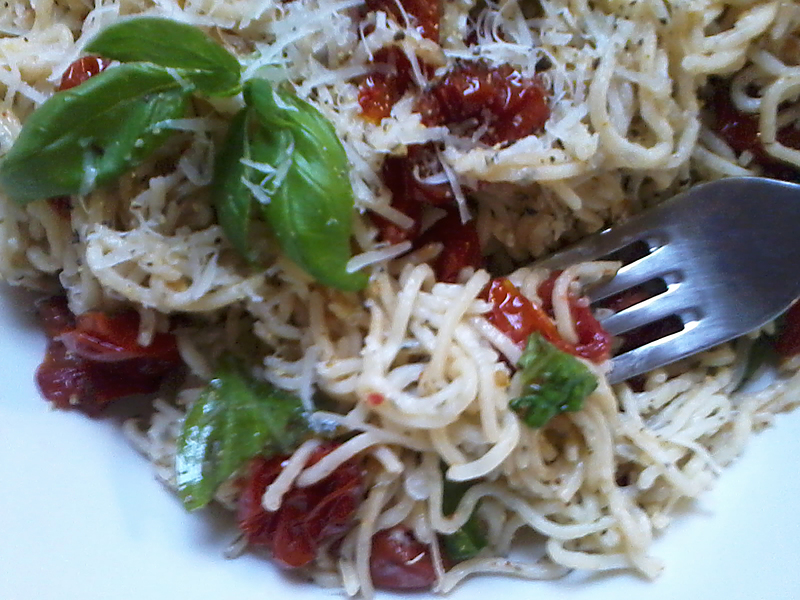 Drizzle with extra virgin olive oil, chuck in the torn basil leaves and toss gently to combine. 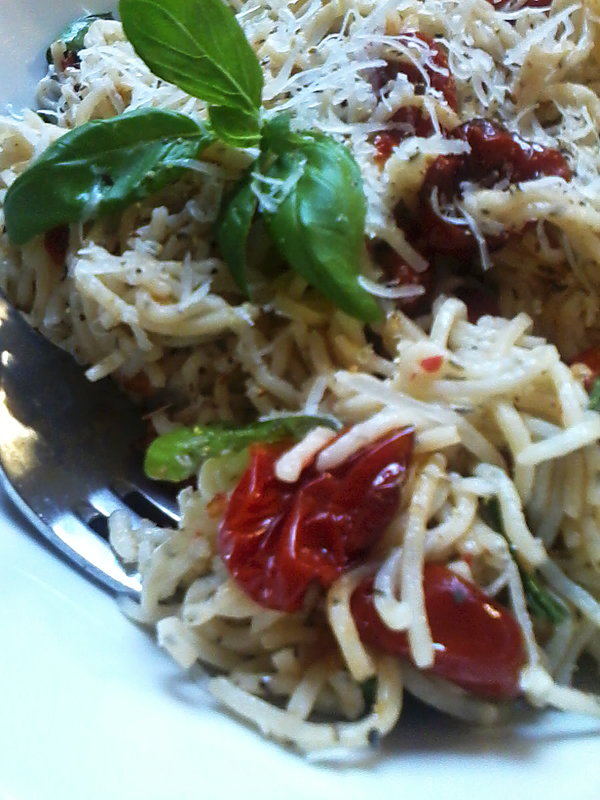 Serve with grated Parmesan and plenty of freshly ground black pepper. *If the dough is sticking, flour the work surface and knead the ball of dough. Then break the ball up and return it to the food processor. Blitz into small pieces to distribute the flour more evenly, tip back onto the surface and knead into a ball. Likewise, if the dough is too hard and dry, break the ball up and return it to the food processor. Blitz into small pieces and add a little more water. Once it has come together again, tip back out onto the work surface. *** This is a vital part of the process in order to stop the spaghetti clumping together. The flour should wash off when it is being cooked. What a wonderful recipe! I also love tomatoes of every variety and firmly believe a meal’s not a meal unless it includes tomatoes! I also thought there wasn’t any benefit in buying more expensive tinned tomatoes until a couple of weeks ago we were in Umbria where I unintentionally bought some premium tinned tomatoes from the local shop. I could not believe the difference they made to the ragu I made that evening. Rather foolishly I didn’t take a note of the exact brand (although I’ve never seen them in the UK, hence the mistake in the first place) but the closest I’ve found at some Cirio “Tuscan” Chopped Tomatoes. They have a depth of flavour and are much less watery than the chopped tomatoes I normally buy. I don’t think they’d make much difference in a chilli but in a sauce for pasta, for me they did. Totally agree with you, when it comes to fresh tomatoes I always buy the really good ones.